Undercrown milling is a specialized feature that can maximize both strength and weight. Here's a breakdown on how it works. Racing pistons incorporate a fair amount of subtlety effective technology; most of it designed to optimize ring seal and enhance piston durability in a tough operating environment. 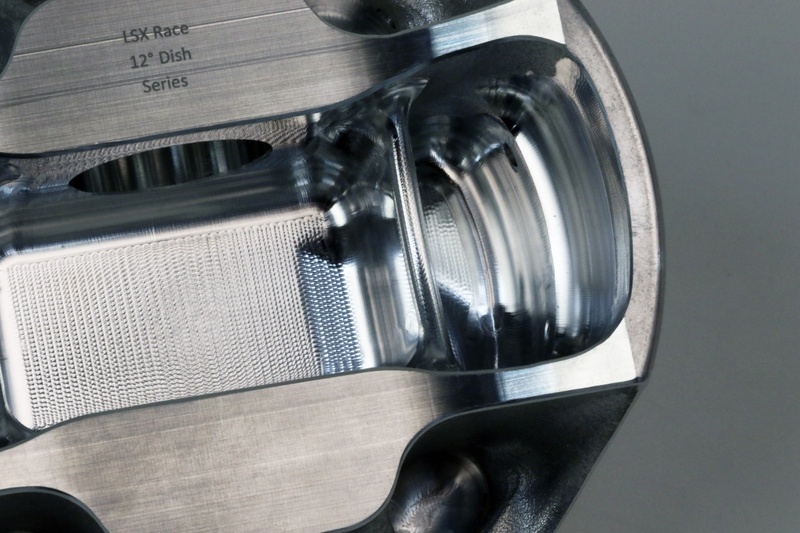 Smooth, flat ring grooves, custom skirt profiles, gas ports, forged sided reliefs and pin placement are all part of a racing piston recipe, but some applications call for even greater efforts to optimize piston performance. 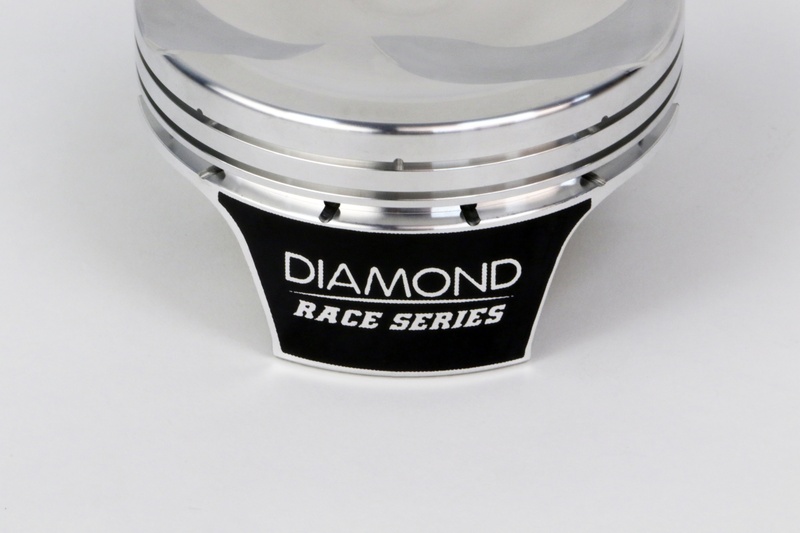 Diamond's new LS2K Race Series pistons are an example of a piston treated to full undercrown milling. A lot of racing pistons are off-the-shelf ware because they suit a specific and popular requirement and are sold in considerable volume. These pistons incorporate proven performance features and generally require very little preparation other than verification of valve-to-piston and piston-to-wall clearance. Still, a surprising number of piston applications call for supplementary procedures to fully optimize their performance capabilities; among them, a precise operation called under crown milling. Piston forgings are essentially hammered aluminum slugs with very basic shapes. Many forging slugs will accommodate machining operations that can create pistons for different brand engines with similar dimensional characteristics. Under crown milling is exactly what it sounds like. Milling operations are performed on the underside of the piston crown to achieve uniform crown thickness, eliminate stress risers in the weakest areas and to lighten the piston. In some cases, the forging might not match the application ideally, so it is milled to correct the differences. This is often the case with boosted or nitrous applications or engines for which the manufacturer doesn’t have a blank. Under crown milling is a custom procedure unique to each piston. Its primary purpose is to remove unnecessary material to achieve uniform crown thickness and lighten the piston. It helps correct balancing issues and eliminates stress risers in critical areas. In cases where specialized pistons are being made for an unusual restoration project, they can sometimes start with an existing forging and modify it to suite the necessary requirements. Custom pistons of this sort are called for more often that you might expect, and Diamond excels at meeting those needs. By matching a forging slug to the correct bore size and pin placement they can also locate the position of the ring pack and employ under crown milling to create a better piston than the original application. Most milling operations are confined within the area defined by the skirts and the pin bosses. Material is removed here to achieve the desired crown thickness. 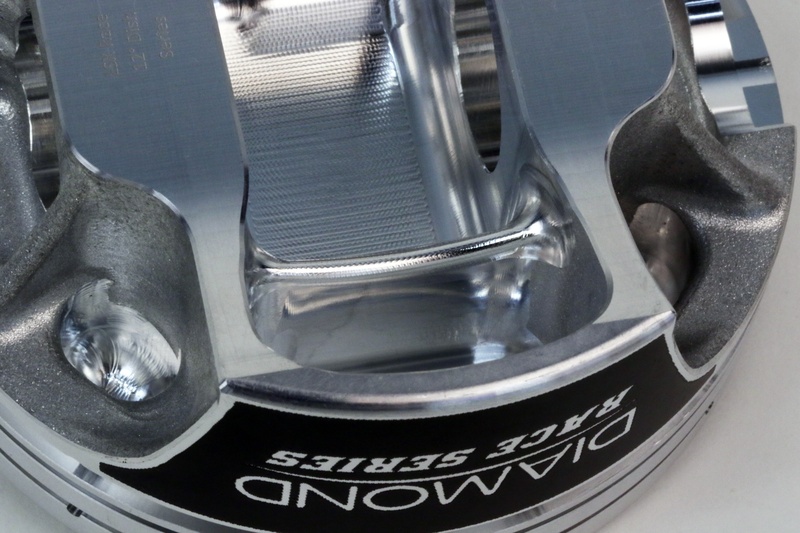 The milling operation incorporates blending techniques to eliminate stress risers. The primary intent is to achieve uniform crown thickness for optimum durability and weight. To accomplish this, the piston is modeled in Solidworks and areas of concern are defined on-screen so the piston designer can make the appropriate adjustments. The weakest areas are identified and avoided so that the piston retains maximum strength. 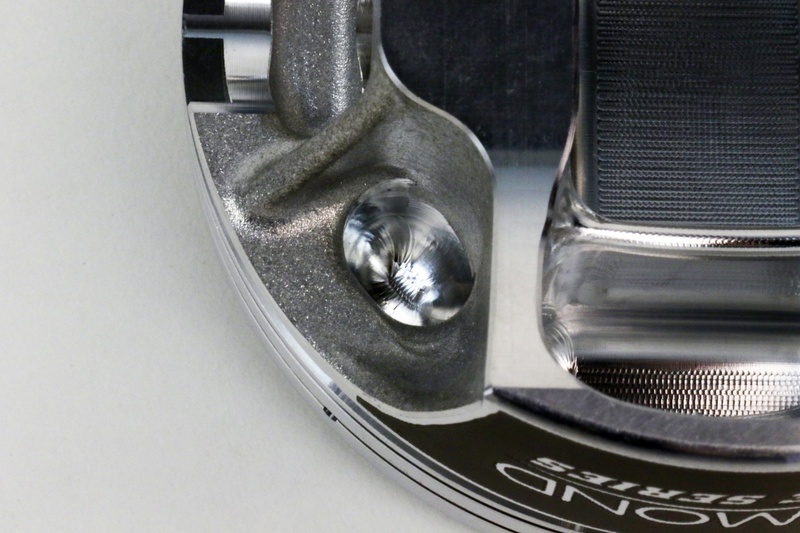 Under crown milling usually does not affect ring lands or valve relief’s, but in may case there are areas and small pockets outside the pin bosses that also receive minimal milling if it is deemed useful. It can, however be employed to alter the center of gravity on a piston. And it is also used to match existing pistons or damaged pistons weight to allow the customer to avoid re-balancing. This piston has undergone interior and exterior under crown milling along with milling around the wrist pin bosses and inside the skirts. The Chrysler Hemi is a good example because it is inherently lopsided with unequal valve reliefs at different heights. Under crown milling helps correct the condition and make the piston balance on the pin. Where a big block Chevy may have a 45cc dome, a Chrysler 426 has a 100cc dome because of the chambers and the high/low valve placement. 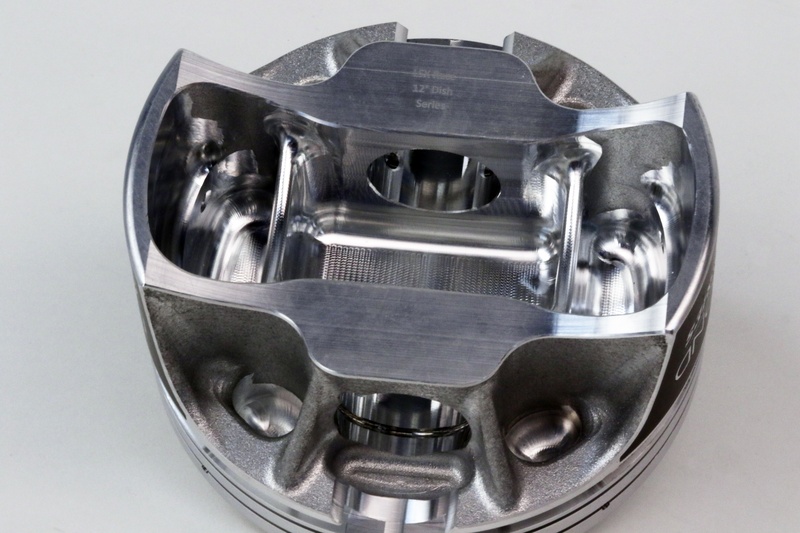 The Chrysler is a clear example, but under crown milling can be applied to any pistons to achieve the weight and strength characteristics a customer is seeking. Diamond piston tech salesmen will query a customer regarding the compression ratio, engine speed, stroke, rod length and estimated horsepower to determine the best course of action for milling the piston. They recommend a minimum crown thickness of .120-inch and usually more according to the specific application, particularly if the engine is boosted or supplemented with nitrous oxide. Many customers what to lighten their pistons, but too little crown thickness will cause cracking and failure due to flex. The tech reps will steer the customer in the right direction to ensure satisfactory results. Notice how undercrown milling has been used to radius the support running between the pin bosses. To the touch, this formerly squared off piece is perfectly round. Application specific requirements may not have available forged blanks to fill a customer’s needs so milling becomes necessary. In addition to lightening the piston, the intent is to make the area under the valve pockets equal in thickness to the overall crown and to smooth all the surfaces to eliminate stress risers. Everything is 3D milled to blend radiused corners and eliminate any areas where a crack could initiate due to flexing under high combustion loading. Older antique car engines with a tall compression height often require custom billet pistons with specialized parameters. In some cases that includes engines that are piston guided versus rod guided and they are machined the full length of the skirts. The under crown is milled for weight reduction because many of these pistons are excessively heavy. And they frequently incorporate a heavier ring pack so milling for weight reduction is beneficial. Under crown milling can also be used to reduce piston overall weight. Notice this machined well between the ring land and pin boss. Material here is not needed for strength and can be machined away for lightening. Custom pistons for restoration engines are frequently made from billet stock so they are fully machined. The piston designer can specify the crown thickness in the programming and under crown milling will occur as part of the process. The result is a stable, balanced piston optimized for the engine and far superior to the original pistons. 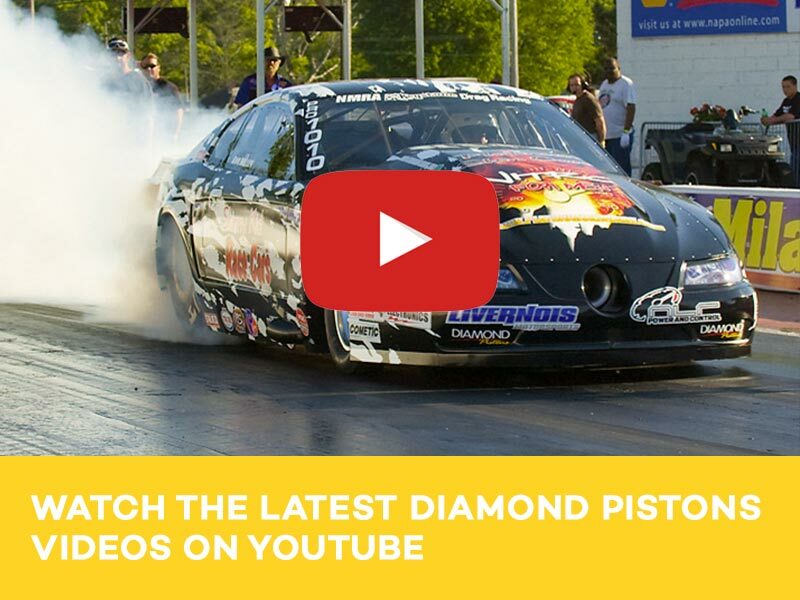 Diamond maintains a programming library, so the piston designers can go into Solidworks to determine the scope of the under crown milling operation on any given piston. The red areas on screen tells the engineer the thickness and what he can do to correct it for optimum crown uniformity. Sometimes balance consideration is also relevant to the crank because there is not enough room on the crank throws for heavy metal. Professional engine builders and restoration specialists frequently gravitate toward under crown milling procedures to meet their specialized needs, but any racer or engine builder can take advantage of the benefits that include a lighter, more responsive rotating assembly, robust piston strength, easier balancing and the ability to get pistons to suit almost any application.